Tonight, it ends. The first-round matchup between the Boston Bruins and Toronto Maple Leafs see yet another Game 7. Both teams have had strong games, weak games, and everything in between. For one team, they move on to face the Columbus Blue Jackets in Round Two, the other heads home for the offseason. Everything remains the same for the Bruins after Sunday’s Game 6 victory in Toronto. Tuukka Rask and Frederik Andersen are the starting goaltenders for Boston and Toronto. Right out of the gate, the Bruins attacked the Leafs defence with some quick shots and a close wraparound shot by David Pastrnak. Frederik Andersen seemed a tad bit slow on the wraparound but makes the save nonetheless. Boston looking not too bad to start off this Game 7. Not too long after, Tuukka Rask makes a large save for himself on Auston Matthews right in the slot. Later in the early stages to the period, the Bruins with some solid shots on goal or some that just miss by a hair. Torey Krug lightens up the crowd even more than they already are with a huge hit on Trevor Moore that knocks his helmet off. After a solid Game 6, Krug is looking to have another big playoff game tonight. As the period continued, Boston seemed to relax a little or Toronto just had their legs more. Both teams commit numerous icings consecutively but the Leafs are the ones getting shots and pressure on the Bruins defence. Tuukka Rask has made some good stops including some huge saves on Mitch Marner but the B’s need to be better defensively. With around five minutes to go in the opening frame, the Bruins fourth line strikes first. Noel Acciari picks off a breakout pass by the Maple Leafs just on the line, feeding it to Sean Kuraly. Kuraly drives the puck in deeper, getting a shot on, but it is Joakim Nordstrom that somehow beats Andersen right in front of him. The puck found the smallest gap imaginable and quite frankly, I’m not sure Nordstrom even saw that opening. No matter what, Bruins are up 1-0 late in the first. With the crowd going crazy in the TD Garden, Jake Gardiner makes a terrible turnover behind his own net with Kuhlman close behind him, leading the puck to Marcus Johansson who spins and shoots the puck past Andersen. Johansson finally gets on the board for his first goal of the postseason and Boston takes a big 2-0 lead late in the frame. With the constant pressure on the top-six by the Leafs, the Bruins’ bottom-six needs to show up and so far, they are. As the final seconds tick away, Boston nearly strikes again with some good chances by DeBrusk, (who is all over the puck tonight) and Pastrnak. However, Andersen makes a big toe save and we enter the first intermission. In the first five minutes, Bruins get some chances off a long airborne pass to Pastrnak but some fanned shots don’t result into anything. Exactly 3:54 into the period, John Tavares comes onto the ice, gets the puck, and snipes one far-side on Tuukka Rask to cut into Boston’s lead. Tyler Ennis does a great job taking the puck away from the Bruins player – resulting in the goal. 2-1 Bruins early in the second. The goal for Toronto gave them tons of momentum as the Matthews line puts hard pressure on with some high-quality shots and chances but with the help of Rask’s play in net, Boston keeps it 2-1. The Bruins need a big hit or preferably, another goal to shift the momentum once again. Eight minutes into the second, Zdeno Chara does a great job pinching to keep the puck in the offensive zone. As a result, Danton Heinen rips a wrist shot at Andersen’s chest, leaving a juicy rebound for Brad Marchand. Marchand shifts the puck to his backhand but cannot lift the shot over the sprawling Andersen. Extremely close opportunity to extend the lead to two goals again. In a net-front battle, Brandon Carlo cross-checks the back of Andreas Johnsson and the officials are not going to have it and Carlo goes to the box for two minutes. I personally think it is a weak call, but it is called so Boston heads to the penalty-kill. The Maple Leafs get some close calls with the scary threats of Matthews, Marner, Tavares, and Rielly but a lot of missed shots keep it a one-goal game. Boston successfully kills off the penalty. Even though the game is back to 5-on-5, Boston is allowing the Leafs to walk all around their zone and they fully rely on Tuukka Rask in the net. Fortunately, Rask has made some big saves but the five skaters on the ice wearing the Spoked-B are chasing the Maple Leafs and cannot form any sort of breakout whatsoever. Eventually, the Bruins get some offensive control of their own and the team is able to make a successful line change while in Toronto’s zone. In the final six minutes or so, the B’s have been able to shut down a lot of the chances against Rask and they have looked a bit better since the goal by Tavares. With all of that, the second period ends there – only twenty minutes remain in Game Seven. The Boston Bruins finished the frame with a lot better pressure and much better control. Not as many shots, but a good end to the period. Also, some post-whistle pushing and shoving before we head into the second intermission. Twenty minutes to go… and the Bruins strike early. Noel Acciari leaves the puck for Sean Kuraly in the neutral zone. Kuraly weaves into the Leafs zone with slick hands and snipes it clean past Rask. The clutch play by Sean Kuraly in the playoffs continue with this massive insurance goal less than three minutes into the third period. He has been a key player for Boston in the two games that he has returned. Playoff Sean Kuraly is back. With 14:41 to go in the third, the linesman catches the Bruins with six players on the ice – too-many-men – a bench minor that will put Boston to the penalty-kill for the second time tonight. Boston kills off the penalty will almost ease and it is back to 5-on-5, impressive to be honest. As the minutes go by, the Bruins play gets better and better. All of a sudden, the Maple Leafs are having trouble entering the zone, especially Mitch Marner and John Tavares. Boston is not laying back, but not taking risks either. It is a calm style of game for the Bruins right now and it is exactly what they want. The Bruins have blocked 15 shots thus far. The Maple Leafs have blocked two. Toronto did not have many great opportunities to score in the final regulation period, except for a close call that took a weird bounce off of the post. Mike Babcock pulled Andersen with roughly three minutes to go in the game and Sean Kuraly makes a nice play to allow Krejci to find Charlie Coyle who buries it in the open cage. Bruins take a 4-1 lead and are only minutes away from round two. Bergeron added an empty-net goal in the final seconds to make it 5-1. And with that, the Boston Bruins eliminate the Toronto Maple Leafs in seven games and advance to the second round against the Columbus Blue Jackets. It’s Stanley Cup Playoff time, baby. For the 16th time in league history, the Boston Bruins will meet the Toronto Maple Leafs in an Original Six, best-of-seven series in the Eastern Conference Quarter-Finals of the 2019 Stanley Cup Playoffs. Coming into the postseason, the Bruins and the Leafs have been atop the regular season standings for much of the year, with the Bruins finishing second in the Atlantic division and third in the NHL. The Maple Leafs concluded the 2018-19 campaign third in the Atlantic but finished as the seventh-best team in the NHL’s league standings. Brad Marchand has had an incredible 2018-19 season for not only the Bruins but himself as well. The Nova Scotia native hit the 100-point plateau to become the first player in a Bruins sweater since Joe Thornton to hit such mark. Dating back to March 1st, Marchand has 10-15-25 numbers within those sixteen games and he looks to continue that dominance against Toronto. In that same time span, it was offseason signing John Tavares that led the Maple Leafs in points since the beginning of March, scoring eleven goals, nine assists, for 20 points in 18 games played. Tavares finished the year with 47-41-88 numbers in a full 82-game season, the highest single-season point total in his entire NHL career that dates back to the 2009-10 season. Patrice Bergeron has been quite hot for the Bruins all season – as usual. The 33-year-old Canadian set a new career-high with 79 points on the season. Bergeron has scored ten goals and helped out on eleven others for 21 totals points in the last 17 games since March 1st. Bergeron’s linemates David Pastrnak and Brad Marchand have been reaping the benefits from Bergeron’s stellar season offensively and defensively. Mitch Marner will be the next Maple Leaf to have some serious contract issues to sort out once the playoffs conclude but in the meantime, Marner will continue to be a serious threat to the opposing defence and goaltenders for years to come. Marner tallied 4-15-19 numbers in the last fifteen games he played in, extending his season totals to 26-68-94 in all of the 82 games. Along with Matthews, Tavares, Nylander, Hyman, and so on, the Leafs possess a dangerous offensive core for the Bruins. Frederik Andersen has been one of the biggest question marks for Toronto’s playoff run in 2018-19. Numerous analysts and broadcasters of the sport agree that Andersen needs to be the best player on not only the Maple Leafs but on both teams if Toronto wants to advance to Round Two. However, since March 1st, Andersen is 6-3-4 with a .898 save percentage and a 3.40 goals-against-average. Those are well below the numbers required from him in this best-of-seven series against Boston. The goalie on the opposite end of the arena tonight – Tuukka Rask – has not been fantastic either. Rask has a 6-5-0 record in his last eleven starts, possessing a .881 save percentage and a 2.89 GAA. Rask has had a good overall campaign for the B’s, but he too will need to be on the top of his game in order to win four games against the Leafs. Tuukka will be depended on in some of these upcoming games. Nazem Kadri has fallen down the depth charts in Toronto ever since John Tavares walked into the dressing room, but he is still depended on by the Leafs management in order to produce some depth scoring for the Maple Leafs. With that said, Kadri only has a single goal in the last 14 games played and has a -3 rating in that time as well. 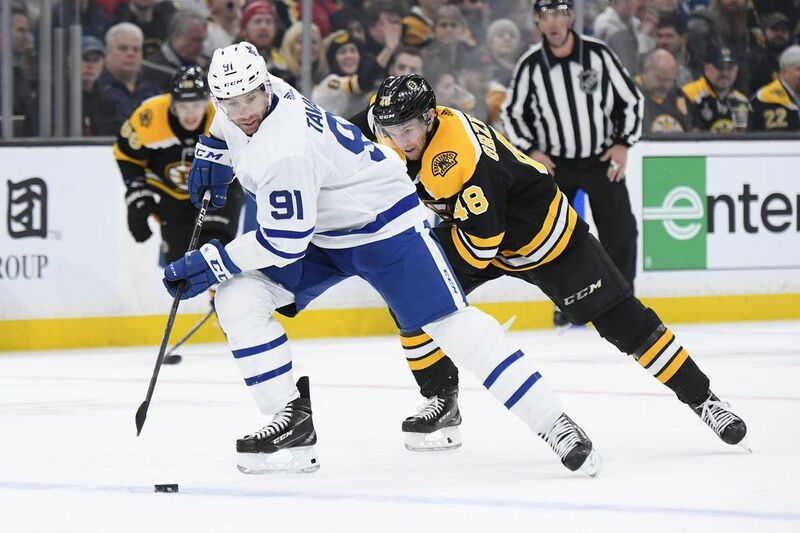 From the beginning of the season back in October, it was assumed that the Boston Bruins would once again battle the Toronto Maple Leafs in the opening round of the 2019 Stanley Cup Playoffs. While both franchises made changes in the offseason, they still did not match up well on paper to overtake the Tampa Bay Lightning for the top divisional spot in the Atlantic and that is exactly what turned out to be the case. The Bruins finished second in the Atlantic, with Toronto only seven points behind in the third position. As we prepare to go to war for what is likely to be another seven-game series, it is important to remember that you may not have any fingernails remaining when one team eventually gets eliminated – this series is going to be close. The Bruins will look to score first and keep it going from there as they have found previous success during the regular season when doing so, finishing with a combined record of 34-7-5 when scoring the game’s first goal. However, Toronto will look to do the same thing and quiet down the roaring Bruins home crowd in the TD Garden. Either way, it will all come down to the men in between the pipes. Whoever plays the best in the crease will come out victorious tonight and most likely in the series as that is how it has been over the course of their history as Original Six franchises. Nonetheless, we are oh-so-close to the 7:10pm EST puck drop in the TD Garden in Boston, Massachusetts. Get ready, it’s about to get fun. Just looking at who the Bruins have added and subtracted from their roster since last season’s matchup, it’s clear that this is a better roster than last year. Marcus Johansson and Charlie Coyle have both been very solid pickups at the deadline. While they haven’t been lighting up the scoresheet, they have provided much-needed stability to the middle-six group of forwards both offensively and defensively. Neither has had incredible playoff success (Johansson with 30 points in 72 games and Coyle with 15 points in 44 games), but the experience is almost just as important as success in the playoffs. One major addition (which isn’t technically an addition) is Brandon Carlo. Injured the last two post-seasons, this will actually be the first playoff action Carlo will play in his career. Last season, Charlie Mcavoy and Zdeno Chara shut down Auston Matthews, and the Leafs first line but other players like Mitch Marner and Patrick Marleau were still able to have very successful series matched up against guys like Adam Mcquaid and Kevan Miller, who were better suited for a 3rd pairing role. Karson Kuhlman and Connor Clifton have both had very successful rookie stints with Boston and will look to continue that in the playoffs. Kuhlman’s speed should fit well when playing against the high-flying Maple Leafs squad and Clifton’s physicality is a perfect fit for the playoffs. Chris Wagner and Joakim Nordstrom have both been pleasant surprises and have improved the Bs’ depth considerably. In all honesty, the Bruins didn’t lose too much. Rick Nash had just five points in 12 playoff games last season. Wagner and Nordstrom have filled the roles of Tim Schaller and the rest of the depth the Bruins lost admirably and with the depth at D, Mcquaid and Nick Holden won’t be missed too much. So obviously the Maple Leafs won the John Tavares sweepstakes. With JT, Austin Matthews, and Nazim Kadri, the Leafs now boast arguably the best 1-2-3 center punch in the league. Along with improving their center core, the growth and success of the Leafs’ youth can really be seen as a major addition. The last series, we saw glimpses of the skill that youngsters Andreas Johnsson and Kasperi Kapanen possess but throughout this regular season, they took major strides. They both had career years, boasting almost identical stat-lines with Johnsson notching 20 goals and 43 points in 73 games and Kapanen scoring 20 goals and 44 points. Arguably more game-changing than the Tavares addition was the addition of Jake Muzzin. The Leafs traded for the former Kings defenseman at the end of January and has really solidified the Maple Leafs D-core. In 30 games in Toronto, Muzzin has scored five goals, adding 11 assists with a plus-11 rating. These additions didn’t come without a cost. The Leafs lost a lot of really good pieces that hurt their depth, but more importantly, it hurt their special teams. Losing guys like James van Riemsdyk and Tyler Bozak has hurt their powerplay considerably. JVR’s 11 goals and 20 points, as well as Tyler Bozak’s 13 points, left considerable holes on their PP, dropping to 21.8% from their previous 25% success rate. Along with that, the Leafs lost many of their best face-off men, which is crucial in the playoffs. Dominic Moore (54.3), Tyler Bozak (53.6) and Tomas Plekanec (57.9) all proved to be very valuable on the face-off dot and again will leave big shoes to fill. With this, the team’s penalty kill has also slipped from 81.4% to 79.9 and losing the veteran leadership from these guys, and Leo Komarov will certainly hurt come when they meet. So have both teams improved since last year? Yea. Will the results change? Only time will tell. I still got Bruins in 7. The Boston Bruins were on a five-game winning streak until they took a tough 4-2 loss to the Washington Capitals on Thursday. Ryan Donato and David Krejci scored the only goals for the Bruins while Jaroslav Halak made eighteen saves on twenty-one shots. Boston still holds a two-point cushion on the Buffalo Sabres for third-place in the Atlantic division but sits four points behind the Maple Leafs for second in the division. The Toronto Maple Leafs have had a back-and-forth start to their 2019 calendar year. After a 4-3 loss to the Wild to begin the year, the Leafs beat the Canucks 5-0, lost to the Predators 4-0, and most recently, defeated the New Jersey Devils 4-2 on Thursday. Toronto currently has a four-point edge on the Bruins for second in the Atlantic division, but still sit twelve points back of the Tampa Bay Lightning. Bruins goaltender Tuukka Rask is expected to get the start in tonight’s game against the Leafs and it makes perfect sense. The 31-year-old goalie has won each of his last four starts including a 4-0 shutout (his 42nd of his career) against the Wild on January 8th. In 2019 so far, Rask’s .982 save percentage is the best in the NHL and he is tied with Jordan Binnigton for best goals-against-average (0.50) in the two games played. Free-agent acquisition John Tavares has been great for Toronto this season. In forty-three games played, the 28-year-old centre has twenty-nine goals and twenty-one assists for fifty points in that span. In the 4-2 win over New Jersey, Tavares scored two goals and added a helper for his fourth three-point game of the 2018-19 season. Bruins defenceman Torey Krug is often in the middle of the Bruins trade rumours, but the 5-foot-9 defender is making a trade tough to deal with. Since coming back from injury, Krug has 4-25-29 totals in 33 games this season, including six points in his last five games. Krug also ranks third on the Bruins roster for most power-play points (18) behind Brad Marchand (19) and David Pastrnak (25). After a brief two-game pointless streak, Maple Leafs forward Mitch Marner came right back with a goal and an assist in the win over the Devils, bringing his season totals to 16-41-57 in 43 games. Marner leads the Leafs in points and is ninth in league scoring. His 41 assists so far tie him with Johnny Gaudreau of the Calgary Flames for fifth-most assists in the NHL. It may seem odd to say, but Bruins leading scorer David Pastrnak is on a little bit of a cold streak. In the past three games, Pastrnak has failed to score a single point and has been a minus rating in two of those games. The three-game pointless streak is minor for Pastrnak, who has 25-27-52 totals in 44 games this season, but the Bruins need him to start picking up the pace offensively. Like every team in the National Hockey League, the Maple Leafs have had their fair share of injuries as well. Lately, starting goaltender Frederik Andersen and backup goaltender Garrett Sparks both went down to injuries, leaving Michael Hutchinson to man the crease. The 28-year-old goalie has gone 3-3-0 with the Leafs along with a .886 save percentage and 3.29 GAA. Not good numbers, especially heading into tonight’s game against the Bruins. William Nylander was in all the big news talks from the offseason right until December 1st when he signed his new contract. But since then, the former 8th overall pick in the 2014 NHL Entry Draft has only scored three points (one goal, two assists) in fifteen games. Nylander is a -2 rating with 12 penalty minutes. For the fourth and final time in the 2018-19 regular season, the Bruins and Leafs will meet on the ice for one of the best-renewed rivalries in the NHL today. To this date, Boston has taken 2-out-of-the-3 games, with the most recent win coming on December 8th – a 6-3 win. Michael Hutchinson has not been too consistent in his recent time with the Maple Leafs. As with many other games, the Bruins need to bring down the confidence level of the opposing goaltender, in this case, former Bruin Hutchinson, in order to get a strong lead on the game. In the two wins for Boston this season against Toronto, they have scored the first goal, in fact, they scored the first three goals in each of those two wins. The one time they lost – Toronto opened the scoring. It is a good chance that that trend continues in Toronto here tonight. Bruins also need the help of Leaf-killers, David Pastrnak, Patrice Bergeron, and Brad Marchand to lead the Boston offence early and often while Tuukka Rask needs to continue his recent solid play to keep the offence of Toronto quiet. These two teams are closely matched and this will be the final time they get to play each other until the almost inevitable playoff series come April. Nonetheless, it is bound to be a great, competitive game of hockey. Below are most likely the lines of the Bruins heading into tonight’s game. Defenceman Charlie McAvoy returns to the lineup after missing time with a foot infection, while John Moore is scratched by Cassidy tonight. Check out the available tickets from our advertising partner SeatGiant for your next Boston Bruins game. Click the link below, and when purchasing any event ticket — from the NHL, NBA, MLB, NFL to concerts and shows — please use discount code BNGP to save a little money. Thank You! David Pastrnak burst out of the gate to begin the season for the Boston Bruins, and he immediately looked like a contender for the Rocket Richard Trophy. Given that Pastrnak was coming off consecutive 30-goal seasons, he looked like a prime candidate to top that leaderboard. In his 12 games in October, Pastrnak scored an incredible 11 goals. It was always extremely unlikely that Pastrnak was going to continue at a rate in which he would have eclipsed 70 goals by the time the season ended. Understandably, he has slowed off that pace a bit since then. In his 13 games in November, Pastrnak was still fantastic, but expectedly eased it back and scored a more realistic eight goals. In 14 December games, Pastrnak has four goals and 15 assists for 19 points. He had 10 assists combined for all of October and November. Pastrnak is still generating scoring chances for his teammates, but he hasn’t personally been lighting the lamp with the same type of proficiency he showed earlier in the year. In his 25 games in October and November, Pastrnak had 19 goals on 101 shots on goal, registering an 18.8% shooting percentage. Pastrnak was averaging about 4.04 shots on goal per game in those first two months, and converting those shots on net into goals at a rate that was higher than his 13.3% career shooting percentage heading into this season. Pastrnak was also getting more pucks on goal than ever before, as he had averaged about 2.79 shots on goal throughout his career. His season-high in that category was 3.49 shots on goal per game in 2016-17, so his October and November total this season really represented a leap for him. In the 14 games then, though, the stats have begun to come back down towards what his career totals had been before this season. He has 50 shots on goal in those 14 games, averaging 3.57 shots on goal per game. That is very close to his rate for the 2016-17 season. His December shooting percentage is what has caused the low output. Pastrnak is shooting just 8% in those 14 December games. That December stretch has made Pastrnak fall behind in the chase for that Rocket Richard Trophy, as he is now tied for sixth in the league in goals. Alex Ovechkin is currently the league leader in with 29 goals in 37 games, and he is up by three over Jeff Skinner and John Tavares. Ovechkin has previously won the Rocket Richard Trophy seven times in his career, including five times in the last six seasons. The award has basically become his to lose any season in which he doesn’t miss significant time due to injury, and he deserves to be the favorite as things look right now. David Pastrnak with a knucklepuck through Rinne and the Bruins have a 2-goal lead! With how things are shaping up, the winner of the award this season is going to at least have 50 goals, so that’s where Pastrnak needs to get to have any type of realistic chance. That doesn’t look as safe of a bet anymore after these last 14 games, although it’s not out of the question that he can still get there. If Pastrnak plays in 79 games this season, he has 40 more games to score 27 goals. It’ll be hard, but he’s capable of that type of production. An extremely conservative estimate would have Pastrnak averaging 2.75 on goal in those remaining games and shooting 12%. Those totals are both lower than his career totals and represent a scenario in which Pastrnak underperforms from here on out relative to what he can do. In that hypothetical, the Czech native would still finish this season with 40 goals. That would be more goals than he has ever scored in a season. There are definitely realistic paths for Pastrnak to get to 50 goals, though, assuming that he doesn’t miss extended time due to injury. If Pastrnak averages three shots on goal per game in 40 remaining games, he’d need to shoot about 18% to get to 50 goals, and that necessary percentage would decrease the more shots he gets on goal. If he averages four shots on goal per game in 40 remaining games, Pastrnak would need to shoot about 14.1% to get to 50 goals. That great stretch would also have to coincide with Ovechkin and the other guys ahead of Pastrnak slowing down enough for him to surpass them. The odds of Pastrnak winning the Rocket Richard Trophy have certainly decreased, but he is still very much poised to have the best season of his career. He looks like he’s in the midst of his most impressive season, which is really saying something given how he has asserted himself these past couple years as one of the premier scorers in the league. Even if the Rockey Richard Trophy appears less likely after four goals in those 14 December games, he is going to be among the lead leaders in that category this second half of the season if he’s able to stay healthy. Check out the available tickets from our advertising partner SeatGaint for your next Boston Bruins game. Click the link below, and when purchasing any event ticket, from the NHL, NBA, MLB, NFL to concerts and shows, please use discount code BNGP to save a little money. Thank You and have a Happy New Year! At the moment, the Boston Bruins are in fourth place in the Atlantic Division with 30 points. It may be too early to talk about the postseason, but they currently inhabit one of the Eastern Conference’s Wild Card slots right now. They are sandwiched between their rivals, as they currently sit two points behind the Toronto Maple Leafs, and three points ahead of the Montreal Canadiens. Last week, the Bruins racked up an overtime loss in Detroit against the Red Wings, and a win at home on Black Friday against Pittsburgh, followed by one in Montreal on Saturday night. With Patrice Bergeron, and Zdeno Chara out of the lineup in addition to Charlie McAvoy, Brandon Carlo, and Urho Vaakanainen, the Bruins have had a little bit of trouble finding chemistry with their lines so jumbled. Losing their best center, who is also their best player without the puck, has been a bit of an issue for the Bruins. Luckily for the B’s, defensemen John Moore and Kevan Miller, both of whom have been playing very well this season, returned from injury this week and have helped immensely. Tuukka Rask has also been fantastic in net since returning from his leave of absence. There are three games coming up this week, and two are against teams in the super competitive Atlantic Division. The Bruins and Maple Leafs have met once this season, with the Bruins winning 5-1. Monday night they will meet again at Scotiabank Arena. Naturally, the Leafs will want to come out flying as they would not be pleased to drop another contest to the B’s, after last season’s first round exit, and getting blown out in their first meeting with Boston this season. Toronto is third in the Atlantic Division (and fourth in the NHL) with 32 points. The Bruins are fourth in the division (7th in the NHL) with 30 points. Their top center, Auston Matthews, is still out due to a shoulder injury, but has resumed skating and may be returning in the first week of December. The Leafs are still without William Nylander, as the two sides have yet to work out a deal (the Bruins should make Nylander an offer, but that’s a story for another day). David Pastrnak on close friend William Nylander: "It's definitely hard for him to not play now." Adds that he doesn't regret signing his $6.67M, six-year deal before missing time last season: "I *could be playing in Czech, right? For a couple hundred bucks per month." With Matthews out of the lineup, leading the way for the Maple Leafs is 2015 fourth overall draft pick Mitch Marner, who looks no older than your average eighth grader. Marner has scored 30 points in 24 games, with 6 goals, 24 assists. Superstar center John Tavares and defenseman Morgan Rielly are tied for second in points with 27 apiece. Mitch Marner is just the 3rd player in the last 30 years to record 20 primary assist in the 1st 20 games of the season. Toronto’s defense remains questionable, but the Leafs’ goaltending has been excellent so far this season. Frederik Andersen is 12-7 in 19 appearances, with a save percentage of .931 and a goals-against-average of 2.24. Backup Garret Sparks was between the pipes for the first game against the Bruins this season. He is 4-1 in 5 games and has put up a Save% of .925, and a GAA of 2.57 – pretty solid. The Leafs’ power play is 9th in the NHL and is converting at 23.8% (Bruins are third at 28.4%). The penalty kill is 12th in the NHL at 81.3%, while the Bruins are 19th at 78.4% (ouch). Despite Toronto’s defense is their weakness, they don’t allow many goals. Currently, they’ve let in third fewest goals per game in the league, with only Nashville and the Bruins allowing fewer. The Bruins are going to have to be particularly solid in their own end against Toronto, as the Leafs are a pretty fast team and are skilled offensively. Stretch passes could be an issue if Boston can’t hold onto the puck or handle passes – the Maple Leafs made it obvious last season that they could cause problems for the B’s this way. Former Bruins captain Rick Middleton’s number 16 will be retired in a ceremony before Thursday night’s game against the Islanders. Islanders fans are probably happy about this since Nifty enjoyed much more success for the Bruins than he did when he played for their crosstown rival, the New York Rangers. Despite the loss of star center John Tavares, the Islanders have put together a decent first two months of the season, and are third in the Metropolitan Division with 26 points, good for fourteenth in the NHL. Thursday will be their first game against the Bruins this season. The Isles have gone 3-2 in their last five games, which include a win and a loss against the rival New York Rangers, who are nipping at their heels in the standings at fourth in the Metropolitan Division. The Islanders are 12-8-2, while the Rangers are 12-10-2. They also beat the Devils 4-3 in overtime on November 23, with the game winner being scored by center Matt Barzal, who Bruins fans are either obsessed with or tired of hearing about – no in between. The Islanders are about as healthy as the Bruins, as they are currently without Casey Cizikas (lower body), Andrew Ladd (leg), Matthew Lorito (undisclosed), Matt Martin (upper body), and Linus Soderstrom (shoulder). There is a possibility Cizikas might be back for Thursday’s matchup, which would be huge for the Islanders. Matt Martin may be suiting up as well. Guessing Matt Martin goes back in tonight after missing the last 11 games. Ross Johnston will have to wait for his chance to talk to Tom Wilson about his cat. The Islanders are scoring 13th most goals per game with 3.18, while the Bruins are tied with Dallas for 21st in the league at 2.83 goals per game. The Isles are in the middle of the pack as far as goals allowed per game, with 2.86, good for 14th in the NHL. Right wing Josh Bailey is leading the Isles in scoring with 7-14-21 totals, followed by Mat Barzal with 3-17-20 totals. Brock Nelson and Anders Lee have 18 points each, and Valtteri Filppula will be a player to watch on both sides of the puck, as he’s reliable defensively and can score as well. This will be the Bruins’ third meeting with Detroit this season. The absolutely routed the wings 8-2 in October, with David Pastrnak notching a hat-trick. Last week, the Bruins took on the Wings in Detroit and lost in miserable fashion during overtime. A key faceoff was lost, not one, but two Bruins were unable to strip Andreas Athanasiou of the puck, and of course, he scored a beauty of a gamer winner with a fancy spin move that would have been totally stoppable had anybody opted to play defense. Oy. The Red Wings are 2-2-1 in their last five games. Three of those games have gone to overtime. The Wings won two of those games (Bruins and Devils) and lost to Buffalo in a shootout. Winning this one in regulation would be a good idea, as it’s very clear that the Red Wings are not to be underestimated. They still have speed and firepower in players such as Dylan Larkin, Athanasiou, Anthony Mantha, and UMaine alum Gustav Nyquist. Jimmy Howard has been good in the crease, with a GAA of 2.55 and a Save% of .925. Their backup, Jonathan Bernier, had a rough start, as his stats are 3.54 and .897, respectively, but has been finding his game recently, and had a couple of very solid games last week. Bernier made 49 saves in a single game against Carolina. That statistic should make it pretty obvious that the Red Wings are among the NHL’s worst regarding shots allowed per game (29th in the NHL, at 38.4/game). An important key to this game will be for the Bruins to get as much offensive zone time as possible and capitalize on the many opportunities the Red Wings are probably going to serve up for them. The Bruins should take as many shots as possible, and create traffic in front of the net if they want to be successful. It seems they’re finally starting to find a little bit of chemistry in the new lineup sans Bergeron. Hopefully, they can keep it up. The Boston Bruins made a magical playoff push last season, netting them second place in the Eastern Conference. The team finished with a record of 50-19-12 dubbing them one of the best teams in the NHL during the 2017-18 season. This year, Boston’s path to Atlantic Division supremacy will be one of their toughest grinds yet. 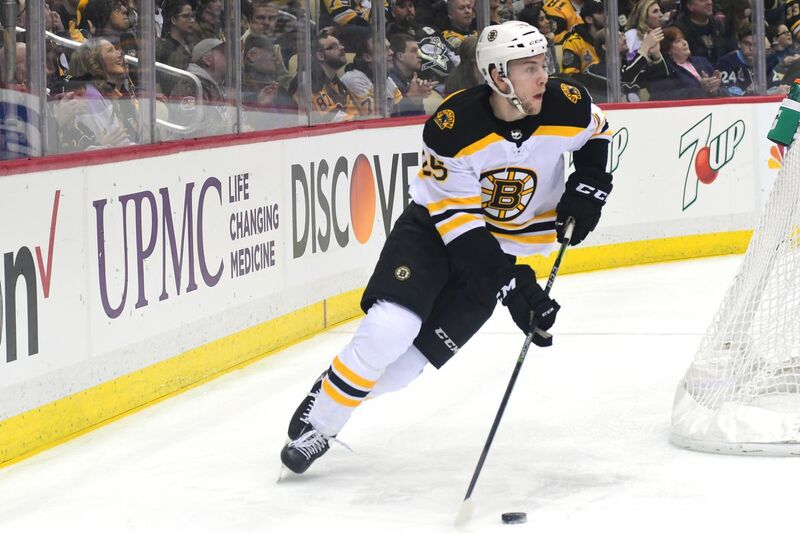 Though young Bruins such as Charlie McAvoy, Jake DeBrusk, Danton Heinen, and Brandon Carlo will likely see improvement this year, it may not be enough to take down some of their most formidable opponents. These teams also feature rosters stacked with young players looking to make an even bigger impact during the 2018-19 campaign, making their path to the top of the Atlantic Division much more difficult. The Tampa Bay Lightning are undoubtedly one of the most feared teams in the Atlantic Division and the NHL as a whole. As a coach, when you see Tampa Bay on the schedule, you circle that date and make sure your starting goaltender is ready to go for that matchup. The Lightning wrapped up the 2017-18 regular season with a record of 54-23-5 netting them 113 points and Atlantic Division champions. Come playoff time, they skated by the New Jersey Devils and the Bruins with just one loss in each series. They then took the eventual Stanley Cup champions in the Washington Capitals to seven games before trading their hockey bags for golf bags. Nikita Kucherov tallied 100 points last year, followed by Steven Stamkos with 86 points and 21-year-old Brayden Point with 66. In addition to Point, they have a young roster featuring names like Mikhail Sergachev and Andrei Vasilevskiy. In other words, Tampa’s strong showing last year is expected to give way to stronger performances for the foreseeable future. "Obviously we're extremely happy he chose to sign with Toronto." Toronto was a tough customer in the first round of the playoffs for Boston and is expected to be throughout the 2018-19 campaign. 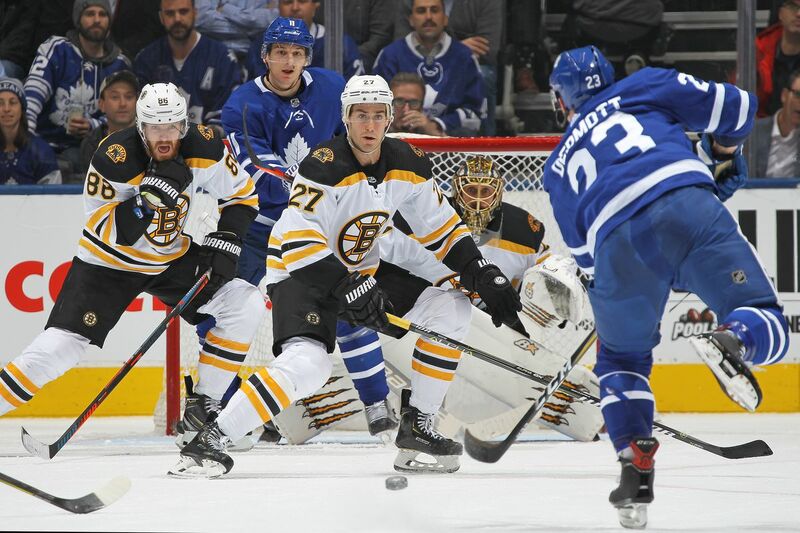 In fact, the Leafs won the regular season series against the Bruins with a record of 3-1. Boston’s road against Toronto is only expected to get tougher, and the Leafs may find themselves ahead of the Bruins in the standings at this season’s end. The Florida Panthers nearly squeaked into the playoffs last season but could very well snag more than a wild card spot this year. The Bruins went 1-3 against the Panthers during the 2017-18 season and could very well see the same fate once more. Young players like Henrik Borgstrom, Aaron Ekblad, Aleksander Barkov, Vincent Trochek, and Jonathan Huberdeau are expected to make considerable contributions to Florida’s cause. The addition of Mike Hoffman this offseason was a solid acquisition despite his debacle with Erik Karlsson before leaving the Ottawa Senators. He threatens to push the team to new heights which doesn’t bode well for Boston. The Bruins and Panthers could very well find themselves battling each other for a playoff spot in the last few games of the season. In the end, Boston’s playoff push will not come with guaranteed results. A handful of their division rivals only seem to be getting better heading into the 2018-19 season, creating quite the test for the Bruins this year. Boston Bruins General manager Don Sweeney speaks to the media during the 2016 NHL Draft on June 25, 2016 in Buffalo, New York. The Boston Bruins have finished their first week of ‘free agency frenzy’, and many fans feel a little underwhelmed. The Black and Gold signed several players that they believed would provide skill and depth to their current roster. The B’s biggest catch so far has been the signing of goaltender Jaroslav Halak, who has been brought on board to back up Tuukka Rask next season. The B’s also made a splash by signing veteran John Moore to a five-year deal. While it cost the team several players, the Bruins front office believe they made the right choices as the B’s head into the 2018-19 season. Bruins general manager Don Sweeney knew that the Bruins had to rebuild the bottom half of their forward core after Riley Nash and Tim Schaller signed with other squads. “Well, the skating component of all the players we added today, I think, was paramount,” offered Sweeney on the team’s summer acquisitions. “Joakim is a great skater. Wags will be forechecking, he’s real hard on the puck. John, from a recovery standpoint, from getting back on pucks, being able to play against different line matchups in situations for us. The Bruins knew they needed to find strong skaters. They were a major player in the John Tavares sweepstakes, but lost out to the Toronto Maple Leafs. “I would’ve preferred it not in our division,” said Sweeney on Tavares’ signing with Toronto. “The overall process was a really good process and structural to have somebody else dive inside our own team, and we were thankful for the opportunity to present. [Tavares’ agent] Pat [Brisson] and his group and John himself were really good about it, and he was well prepared, and we felt we were. “We put our best foot forward and it didn’t fall our way. But, again, to be in that situation is something that our group should be happy about…. it’s, obviously, a reflection of our current players and a testament to them….it’s a reflection of our entire organization. No matter what happens, there will be Bruins fans who believe the front office failed because they couldn’t get Tavares. Still, the B’s missing out on Tavares might have been a blessing in disguise. The Bruins would have spent an awful lot of money on a single player. That would have forced the B’s to dump a player or two at a discount price in order to stay underneath the cap. Factoring in all the choices the Bruins have made, the B’s still have just under $3 million left to work with. The Black and Gold still have a little room to manuver and they might pick up a couple of two-way players just before the B’s start training camp in September. There are a few things that are out of the Bruins control when it comes to the salary cap. The B’s have to deal with the retained salary of Matt Beleskey and the buyouts of Dennis Seidenberg and Jimmy Hayes. Those three players levy a four-million dollar hit against the cap ($3,933,334). The Bruins will still have to deal with Seidenberg and Beleskey next year, and that three-million dollar hit will certain have ramifications as the team tries to keep the youth movement going in the 2019-20 season. The B’s will also have to juggle several of their entry-level players and that will cause problems for the team. If the Bruins are looking to find anyone else, they’ll have to make some kind of move with their remaining roster. That means at least one defenceman could be moved. While a lot of people believe that Torey Krug is the player most likely to be moved, it seems unlikely that the B’s would give away a player that put up 60 points last season. Fans should expect to see some kind of deal that sees Kevan Miller or Adam McQuaid being moved off to another squad before the start of the season. The Bruins have made responsible choices during this offseason. While they weren’t able to bring some ‘A-list’ players to the TD Garden, they’ve been smart about their moves. Don Sweeney hasn’t repeated the mistakes of Peter Chiarelli, and that’s a good sign for the Black and Gold as they get ready for the start of the season.